Oh! My first food blogging event! How exciting (ok and I’m a little nervous too!)! I am quite new to the food-blog-o-sphere, and was really not planning to join any events in the near future (just watch and learn, that was my plan), but when I heard that Megan of iheartbacon.com and Deepfry of Yum! were planning a Virtual 40’s-70’s Party I just couldn’t resist. How fun and peachy-keen is that, right? Another reason I wanted to join is because of this. This dish you see here, that I have made maybe a trillion times in my life. 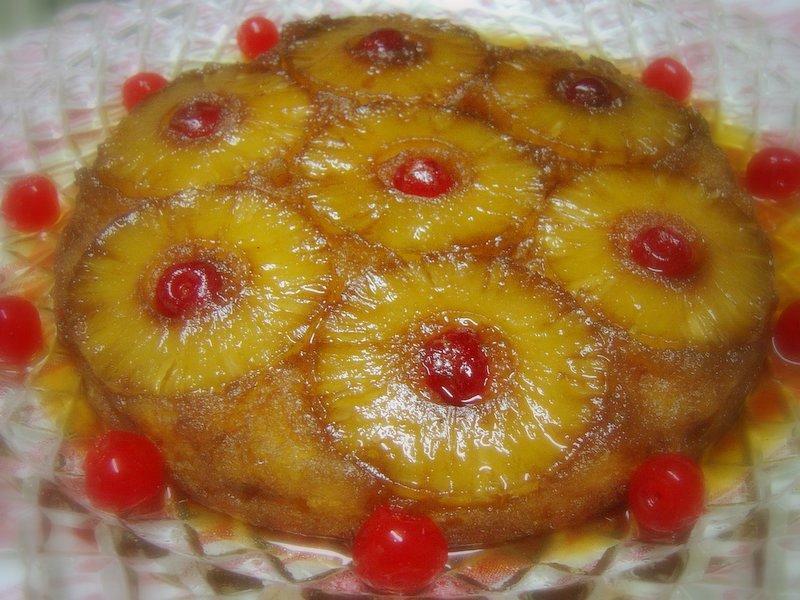 Pineapple Upside-down Cake. Just the name alone bring to mind a 50’s housewife in an apron and a beehive. This is my family’s bar-none favorite thing. Their’s, not mine. I mean it’s yummy and all, but I wanted to make things great and exotic! But no, it was always: “Can’t you just make the Pineapple Upside-down Cake?” Phooey. Well, now it’s payback time and this cake is going to be my ticket to virtual 50’s fun! 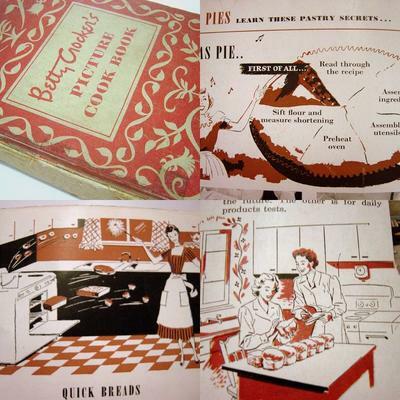 The recipe I use, and have been using (much altered over time), is from none other than another 50’s pillar of Stepfordian baking…the Betty Crocker’s Picture Cookbook! In fact, I have the 1950 First edition (9th printing though). Not discovered in a second-hand bookshop or book market, but handed down from a great aunt. As you can see in the picture below, it’s not the newer ring-bound version. The book binding in the side has actually been worn away already, by many greasy kitchen hands no doubt. In any case, it’s so kitschy it’s cool. Check out the funky graphics of women in wide skirts and cinched waists, singing as they cook. Ok, nevermind that, check out the quick breads flying out of the oven! Now that was a domestic goddess! Melt the butter (I use the microwave, maybe 20-25 seconds). Spread/pour melt-y butter on the bottom of a 9 inch pan. Sprinkle with the brown sugar, make sure it’s even. Arrange pineapples slices and cherries in “an attractive pattern” atop the butter-sugar coating. Preheat oven to 350F. Cream butter and sugar together. Gradually beat in the egg yolks. Add the juice from the pineapple and the vanilla and beat, in all at once. Sift the flour, baking powder, and salt together, and beat in all at once. Do not over mix. Beat egg whites until stiff. Fold egg whites into the batter. Pour the batter into your prepared pan and stick it in the oven. Bake for 45 minutes or until a toothpick “thrust into the center of the cake” comes out clean. Turn upside down onto a nice serving plate. Don’t remove the pan for a few minutes so all the sugar-y topping runs down over your cake (an does not stay stuck to your pan). You may be wondering what that crazy looking picture is on the upper left hand corner on the collage above. Well, as a spin-off to this virtual party, Kevin of Seriously Good has come up with a clever little contest and that is my entry. My my, first a food blogging event, and now a food blogging contest? I’m getting quite ambitious!So there you have it. The ubiquitous Pineapple Upside-down cake. It’s always been around, though much ignored for some time, what with the advent of the elegant “supermodel” desserts. In truth, I actually love this edible 50’s stereotype. It’s definitely stuck by me, and gotten me things I would never have gotten just on my charm alone. So here’s to you Mrs. Crocker, and to the millions of Pineapple Upside-down Cakes who are, as we speak, planning their comeback. wow, this is great! it’s a glistening masterpiece of sugary goodness! i have a friend who has also mastered pineapple upsidedown cake and makes it for all potlucks…he’s always the star of the party. it’s nice to see 1950s dishes that still have such currency. I am scared of pineapple upside down cake. I’m not even all that fond of pineapples, and to have it in a cake is anxiety-inducing. I think I’ve only eaten this type of cake once in my life. :-O It’s incredible though how some desserts are timeless and transcend generations. That cake looks spot-on scrumptious. 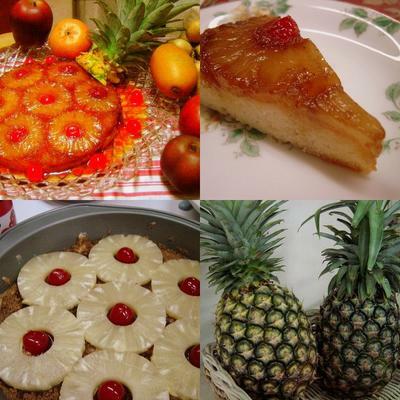 Funny thing it, people either like or hate pineapple upside-down cake; there’s simply no middle ground! I think a line from Nigella Lawson describes it best: it’s both divinely camp and divinely retro. About your question about yeast on my blog, Rustan’s Supermarkets have Fleischmann’s Rapid Rise and Tandaco. You can also use Hovis from Athena at Festival Supermall. Thanks Midge for the yeast info! This looks absolutly yummy. It makes me think an upside down pineapple cake my mother used to make. This is awesome!! It’s hysterical that your dad was just as excited to eat your retro dish as mine was. What’s up with that? And oh my god, did you put Vaseline on the lens for that soft-focus cake shot? Sooo brilliant.